The YouTube video below is from World Class Coaching where you can find many useful coaching resources. This Shooting drill starts with two lines about 35 yards away from goal. There are several different lines set up for passing, receiving, and shooting. The objective is for one player to pass into a target player, then there is a combination play which allows for a player to take a shot on goal. The drill rotates players so there is constant movement with players in different spots and getting experience with the different roles. The importance of all players working together on the field is extremely important. As players get older and the competition gets tougher, combination play becomes more and more critical to having success. Forwards working with forwards, midfielders working with midfielders, forwards and midfielders, outside backs and midfielders…the list goes on and on. Individual play is important, but combination play allows teams to be more effective and aggressive on the field. This drill works on several different things, but it all relates back trying to get a shot and score. It’s good for players to get shots through quick combination plays so they are more comfortable when these situations happen during a game. The final shot is the most important and players need to make sure they are not wasting opportunities. Make sure shots are on goal first, then start focusing on finishing to corners. 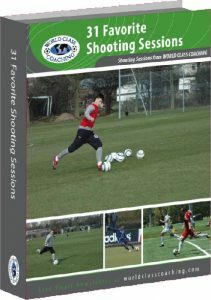 World Class Coaching offers a free eBook that contains 31 Favorite Shooting Drills. Click the image below to download your free eBook. This drill breaks down right from the start because the players are not familiar with it or have any experience. Players need to be constantly pushed to mentally improve on the soccer field. Challenge players to not only do the drill correctly, but understand the reason for it and how it translates to a game. The best players are mentally tough and able to play the game at a high level. The video has sound so please make sure that your audio is turned on and that you have access to the site. Some schools block access to YouTube.